Synthetic peptide (Human) - which represents a portion of human Replication Factor C 1, 140 kDa subunit encoded in part by exons 25 and 26. Our Abpromise guarantee covers the use of ab3853 in the following tested applications. WB 1/1000 - 1/10000. Detects a band of approximately 140 kDa (predicted molecular weight: 128 kDa). Sample: Nuclear Extract (NE, amounts used are indicated) from HeLa cells. 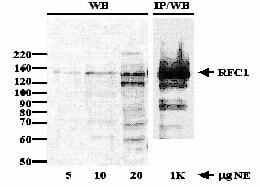 Antibody: Affinity Purified Rb anti-RFC 1 (ab3853). WB - 0.5µg/ml, IP - 2µg/mg NE. Publishing research using ab3853? Please let us know so that we can cite the reference in this datasheet. There are currently no Customer reviews or Questions for ab3853.